Chicken tikka masala is a curry dish of roast chicken chunks (chicken tikka) in a rich red, creamy, lightly spiced, tomato-based sauce. The origins of the dish are disputed. One potential origin attributes its invention to a chef in Glasgow, United Kingdom. Another potential origin is as a variation on a traditional Mughlai dish. Left: Chicken tikka masala with naan. Chicken tikka masala is chicken tikka, chunks of chicken marinated in spices and yogurt then baked in a tandoor oven, in a masala ("mixture of spices") sauce. The sauce usually includes tomatoes, frequently as puree, and either/or both cream or coconut cream and various spices. The sauce or chicken pieces (or both) are sometimes coloured orange or red with food dyes or with spices such as turmeric powder and tomato puree. If you do not want to use a red food dye, you can use paprika instead to get the similar effect. Other tikka masala dishes replace chicken with lamb, fish or paneer. 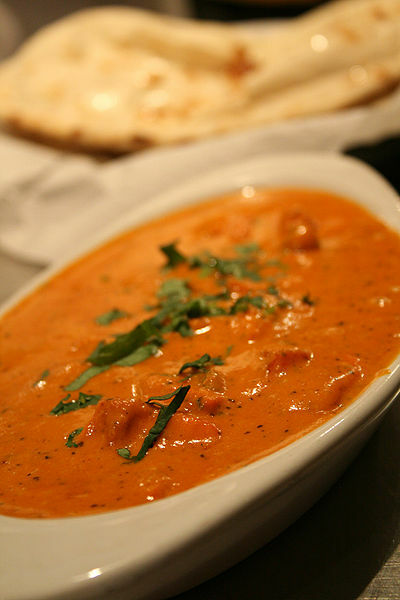 Chicken tikka masala is served in restaurants around the globe. Surveys have found chicken tikka masala to be the most popular dish in British restaurants and it has been called "Britain's true national dish." Due to the demands of British tourists in India, Britain now exports chicken tikka masala to India and Bangladesh.